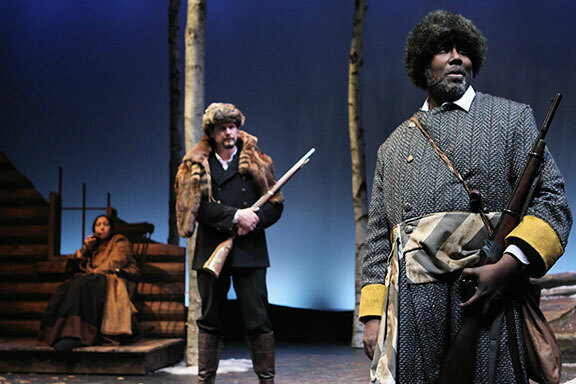 Two years ago the History Theatre presented four new works related to the history of our fair state of Minnesota, as they do every year under the title Raw Stages. The class of 2014 has now all seen full productions, telling Minnesota stories as diverse as a Filipino Debutante's Ball, Minnesota's strangest and most infamous true crime story, a Minnesota boy who grew up to do a little radio show, and a black voyageur in Minnesota's pre-statehood frontier days. These stories are all part of our history as Minnesotans and as Americans, and I appreciate the History Theatre's commitment to developing and producing these Minnesota stories. The last play from the 2014 Raw Stages festival to make it to the big stage is George Bonga: Black Voyageur (previously titled Boundary Waters). It's a fascinating story of friendship, survival, and identity in a world that existed less than 200 years ago, but seems so very far away. Born of an African American father and an Ojibwe mother, George Bonga became a well-known fur trader who straddled the worlds of the Native and White cultures, and was one of the first black men born in what would become Minnesota. The play covers one incident in this man's eventful and historic life, and the implications of that event in his life and the larger community. The play opens in the late 1860s (post Civil War and US-Dakota War, both of which are referred to), when George Bonga (beautifully portrayed by James A. Williams) is being haunted by dreams about the man he once tracked across the frozen Minnesota winter. He tells his wife (Marisa Carr) the story, and the action flashes back to the chase in 1837. After capturing Che-Ga-Wa-Skung (who, thanks to the writing and Jake Waid's talent in bringing him to life, becomes a sympathetic character despite being a murderer), the two have many deep discussions as they try to survive the cold. Che-Ga-Wa-Skung asks Bonga a simple question, "who are you?" Bonga doesn't really have an answer, he's always living on the boundaries, the son of an Ojibwe mother and a black father, and living the "white ways" as a fur trader. Bonga struggles with the question until the two men meet again later in life and continue the discussion. Rounding out the cast are Eric Knutson as two colleagues of Bonga's, and C.W Bearshield as Che-Ga-Wa-Skung's brother. The play touches on one of the ugliest parts of Minnesota history, the way the native people were treated by the state and the country. The characters are affected by the war, the changes in the trade business, treaties, and the annuity system. But this is also a story of friendship between two men who seem very different, yet find a middle ground as they challenge each other and permanently impact each other's lives. The best scenes in the play are the scenes of Bonga and Che-Ga-Wa-Skung just sitting around talking. Although there are a few action scenes, this is for the most part what I like to call a talky play. Fortunately I like talky plays, especially when the actors give natural and believable performances and have good chemistry between them, which is the case here. Playwright Carlyle Brown has created a world that feels real and a story that feels relevant, specific to its time but with echos still reverberating today in the themes of race, identity, and the changing times. 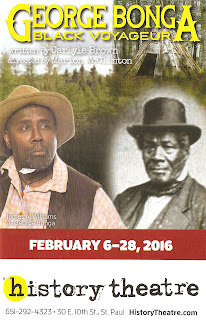 George Bonga: Black Voyageur continues through February 28 at the History Theatre in downtown St. Paul.